Bedtime stories have had a distinctly Roald Dahl theme this year. My son and I have been working our way through his catalogue of children’s books and it’s been wonderful revisiting these magical stories from my own childhood. It’s great to be able to share these classics with such rich characters, plots and memories. Brief. Exciting. But, how is Mr Fox the hero of this story? He steals from the farmers (who are spun to be evil, extreme, disgusting characters) with no sign of remorse. His actions lead to his family’s lives being put in danger and all the other animals going without food for a long period of time. He does put that bit right in the end, with a bit more of the good old stealing. All of that said, I enjoyed the book, as did my son, and thus began a journey of discovery into the world of Roald Dahl. Sweet, lovely, fantasy tale of a girl who hangs out with a giant and they end up saving the world with a little help from the Queen of England. Great stuff. The nature of bedtime stories is that they tend to happen towards the end of the day and this made reading the book a bit tricky. I was tired and the BFG himself speaks in a most peculiarly grammatically confused manner. Reading his dialogue was hard work and I’m not entirely sure it made all that much sense to be honest. Awesome. Exactly what I remembered it to be. An absolute classic. Awful. A couple of random, unconnected stories about a space hotel and some shrinking grandparents. The difficult follow up book was a poor relation. A singular blot on Dahl’s landscape. My son’s favourite Roald Dahl book. We found ourselves really rooting for Matilda and Miss Honey. But it’s the less positive characters which make this book so special. Matilda’s parents and Miss Trunchbull are so ridiculous, horrendous and mean the reader is glad when they get their comeuppance. The film version went down very well also. A classic tale of boy whose parents die having to live with his evil aunties, a giant peach grows in their garden, boy goes inside the peach, meets a bunch of giant insects and arachnids and they all go off on an adventure together. I really enjoyed the characters in this one, but it was longer than I remembered which is probably not a good sign! My mum will tell you that when I was growing up I loved this book, I read it and listened to it on cassette on numerous occasions. The truth is, the first time I read the book was this year, to my son. My mum is thinking of my brother, I’ve told her this and she maintains that she is correct. She is not. The good news is that my brother was correct to enjoy this book, it’s now my favourite Roald Dahl book. A touching story of a father and son breaking the law together for larks and to beat ‘the man’. I love the warmth and affection in the story in the relationship between Danny and his father. It makes me long for his childhood of simple pleasures and wish for it for my own children. Evil grandma gets what’s coming to her when her grandson makes his own medicine using ANYTHING he can get his hands on (including poison). I obviously can’t condone poisoning ones grandparents, but part of the skill of Dahl’s writing is that he makes it ok as she is such a ghastly character. I really enjoyed the character of Mr Killy Kranky, his house gets destroyed, his mother-in-law has been poisoned by his reckless son, she subsequently disappears – but all the while he is focused on the potential business opportunities. Great stuff. Funny. Gruesome. Silly. The Twits are a disgusting couple who don’t like each other very much, but hate everyone and everything else in the world even more. As with Matilda, these characters are so horrible, you don’t mind that they come to a rather unfortunate (if well deserved) end. The animal cruelty aspect, and subsequent revenge of said animals, makes the reader feel particularly strongly against the Twits and glad of their demise. Another new one on me. As this is a short story, you don’t get the same character development and description as you do in his other books. The main character (and possessor of the magic finger) doesn’t even get a name, she is simply known as the girl. It’s a fun book with the morality of hunting for pleasure at the heart of it. This makes it a rich teaching resource for class discussion, and the ending lends itself well to writing a story similar to that which has just been read. A short, autobiographical story, about Dahl’s school days. As such, it’s rather different to his other stories, and not one my son or I will remember fondly for years to come. Interesting to look at if you’re teaching about life in Britain in the 20th century. A good comparison between now and the days of the cane. My 5 year old son always chooses which book we read next and he had been putting this one off. The idea of it seemed to worry him a bit. He had no need to worry. Some of the themes have the potential to scare younger children, but, most of it didn’t bother him at all, or the boy in the story for that matter. When the boy is turned into a mouse by a room full of witches, he seems pretty cool with it all. A great lesson in making the most of a bad lot, and a fun adventure story. A rather lovely tale of a window cleaning company who don’t require ladders because they comprise of a giraffe, a pelican and a monkey who are assisted by a boy called Billy. I found this story to be really enjoyable. It’s not too long and have a fun plot, so would be great for years 2 to 4, as a model for story writing. We’ve still got a few more to read in our collection (Esio Trot, The Enormous Crocodile and Boy), and probably a few more we need to buy. I will add my thoughts on these as and when we read them. 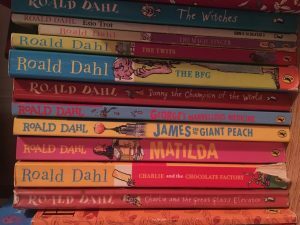 My son and I have thoroughly enjoyed our adventures with Roald Dahl and recommend to begin that journey yourself – no matter how old you are.